Nessa can change into a wolf, thanks to some scientific experiments and a wolf bite, and she studies science at the college level. She works at her father’s lab over the summer while preparing to apply for Stanford admissions. Her siblings try to adjust to living with their dad after spending a life with their late mother. While striving for a makeshift normal life, Nessa’s sister Delphine starts having bad dreams. When their father reveals an experimental chimera that keeps escaping, Nessa has to figure out if her family can avoid tragedy. C.D. Bell made her debut into the author world with Weregirl. She also enjoys biking and reading. The trilogy concludes with Weregirl:Typhon, where Nessa must reconcile her father’s good intentions with his need to pursue science beyond ethical limits. We are happy to have Bell here on Book Riot. 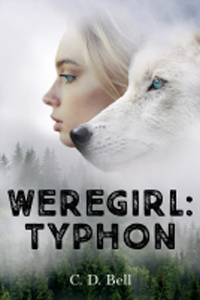 Weregirl: Typhon is the last book of the Weregirl trilogy. How does it feel to come to the end? It feels both sad and amazing. To have gone full circle and told this story from beginning to end, through many twists and turns, building a world seen through not just my own eyes but others’…what an experience! The story blends science facts and fiction to create a thrilling trilogy. How much research went into building the Weregirl world and science? A lot. Each volume of the trilogy introduced me to at least one new topic. From genetics, to chimera, to plant biology, to color theory, to Japan, to all kinds of wolves–you name it. I mentioned science journalists in the acknowledgements of Chimera, I so appreciate these articles that live on the Internet and open up a whole new aspect of life on our planet. I also felt like the research I was doing allowed me to tap into a thesis I have been developing outside of my writing life–that we really should be studying and cherishing the biological life forms around us before they’re wiped out of existence. What was it like developing Daniel’s character, as Nessa struggles with doubts that Daniel may not be the father he seems to be? Daniel was conceived as a pretty bad guy, and throughout the plotting grew increasingly less one-note-evil, which I loved. Yes, he’s made some decisions that could be seen as selfish, but he’s also a dad who loves his daughters. He built a life with Vivian, destroyed it, and built something else. That’s how we find him–imperfect, work-focused, a failed father. There was a lot to work with there. Professor Halliday says that when studying a science, like potential werewolves, one needs to look at culture and art as well as the facts. What is your opinion on that? I suppose she’s right! First, science really is a form of culture, right? All scientific research is commissioned, just as art is. There’s power and cultural interests and the whims of the rich and powerful driving it, or government, hopefully. But science also stands on its own, with the power to endure beyond the circumstances of its commission or not, as art does, based on some sort of internal truth it has the power to contain and deliver. In the case of Halliday drawing out scientific insights from the cultural record of the past, I think that’s fascinating. I love the idea that “Ring Around the Rosie” is a lasting cultural oral artifact of the Black Death (whether or not that’s true). “Don’t let the bedbugs bite” – it tells you that that might have used to be a thing. (And sadly is so again.) That blue was a color not visible to the human eye before the Renaissance–I love that fact. (And don’t check my intel on “Renaissance.” All I can remember is the part about Homer calling the Mediterranean a “wine-dark sea.”) We leave a trail behind in our art, our artifacts, our language. Every word has a story. If you could see colors the way Nessa can, as emotions, what would you see? That’s a great question. My favorite color family is blue–I love sky, water, twilight. But emotionally, blue is too sad. I’d rather be bathed in yellow, warm and relaxed, like a cat sitting in the sunlight next to a window sill. There’s a lot of discussion about how much humanity one chimera hybrid has, and how their wishes are or aren’t respected. What do you hope readers will glean from the chimera’s character arc? One of the things I loved about the Typhon story is the ambiguity and complexity of CM and the dilemma of how to handle the monsters for which you may in fact be responsible? CM’s in a tough spot and it’s hard to imagine a person who couldn’t empathize with her. But at the same time, she’s just not…okay. Meanwhile, the book is filled with other teen characters who have been dealt a rough hand in life and are overcoming it. Broken and bruised, perhaps, but making their way–think Bo, Delphine, even Nessa–they’re all holding it together in the face of some pretty intense life challenges. Two projects–one that’s been on the back burner during the Weregirl trilogy–a restaurant-based middle grade novel. And another that’s perking in my brain for year that I can’t even speak about yet.